Until she meets Dermot Sinclair. The handsome Scot seems to be dogging her every step. At best he's a colleague who can help her research. At worst, he may be stalking her. All Sarah needs to finish her dissertation is one folk song that proves her thesis. Unfortunately, finding that song also means unlocking some painful childhood memories and a dangerous destiny set in motion generations ago. It's a destiny that might get her killed. In another flash Sarah was in the upstairs hall of her grandmother’s house. She was standing in front of a door. She didn’t have to wonder what was on the other side. She knew. She started to turn away, but the door opened by itself and Sarah saw Molly fall limp to the blood-soaked bed. She ran to the bed as she had done on that day years before. Knowing she couldn’t stop it but desperate to ask why. Molly lay lifeless before her, unseeing eyes gazing at the wall above. Sarah lifted her head to see what her mother had been looking at. It was there on the wall, scrawled in Molly’s own blood, the only message that her mother had left: Ruith. 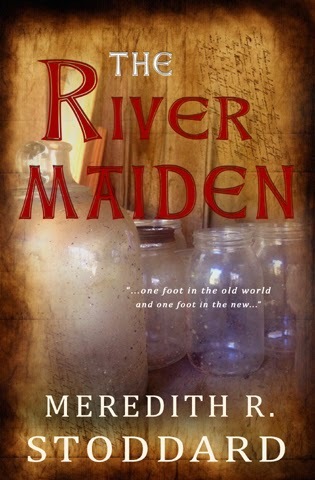 Purchase The River Maiden on Amazon. Meredith R. Stoddard is a writer and fiber artist living in Central VA. She studied literature and folklore at the University of North Carolina at Chapel Hill before working as a corporate trainer and instructional designer for 11 years. She now devotes her energy to fiction and creative non-fiction. When her hands are not holding a book or touching a keyboard they are likely knitting, spinning or felting. You can follow her adventures in fiction and fiber on her website. Thanks for reading, and as always, please feel free to leave your questions/comments for Meredith below!